Dried Chicken of the woods. This mushroom can be prepared in most ways that one can prepare chicken meat. It can also be used as a substitute for chicken in a vegetarian diet. 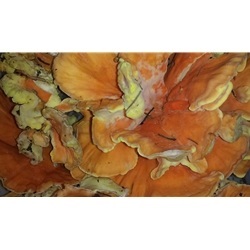 Chicken of the woods are also known as sulphur shelf, Laetiporus, chicken mushroom, chicken fungus, chicken of the wood, chicken mushrooms. These are wild crafted and found in the woods in the Pacific North West, in Oregon. They grow on white fir trees. Be sure to try a small amount to start with due to some people having allergies to them.